93% of coal gas blasts were caused by poor ventilation. China is acknowledged by many to be the most dangerous place on Earth to work in mining, especially when it comes to coal mining. 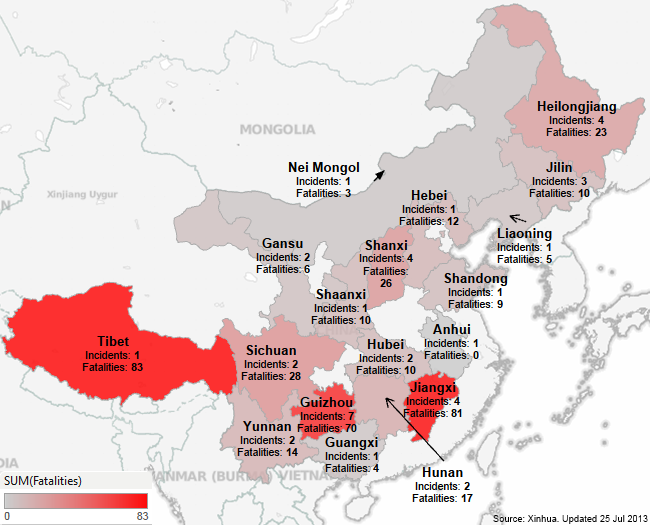 Here is an updated analysis of Chinese incidents resulting in significant casualties as reported by official Chinese media sources through to 24 July 2013. To date there have been 40-major incidents which have been reported by Xinhua. This includes 411-deaths and 229-injuries. Due to a lack of follow-up reporting by Xinhua and the severity of Chinese mining accidents there are also 47-missing persons, many of whom should be considered as deceased. The single largest incident was that of a landslide in Tibet which buried 83 from the Jiama Copper mine under 2-million cubic metres of mud and rock on the 29th March. This single incident also confirmed Tibet as the province with the most confirmed fatalities to date. The South West province of Guizhou had the most reported incidents with seven separate incidents and a combined fatality count of 70. The most serious incident from Guizhou was a colliery gas blast at the Machang mine which left 25-dead and a further 20-injured. Both North East and South West Regions have recorded 11-incidents each. The South West Region (which includes Tibet) had the worst data, so far recording 195-deaths. The North East had 114-deaths. The most recent incident reported by Xinhua was the death of 10 sulphur miners in Chengcheng County, Shaanxi who were killed when a fire broke out on the 24th July 2013. Note: The infographic was created using Tableau Public. Coal continues to be the most dangerous resource to mine in China with 292-deaths or 71% of all reported fatalities. Additionally, with 33 out of the 40 incidents where the resource was known attributed to coal it has dominated the news representing 82.5% of all reported incidents. 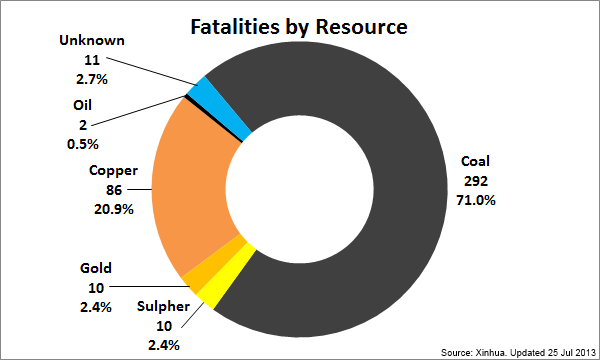 Copper was the second most dangerous resource by numbers with 86-deaths (20.9%) but only two incidents (5%). Although we are just over half-way through the year I believe that percentile will come down further given that most of fatalities from copper mining came from a single incident (the Tibetan landslide) which even by Chinese standards was unprecedented. Other commodities with reported deaths include gold (2.4%), sulphur (2.4%) and oil (0.5%). There have been two incidents and 11-deaths that had no details of the resource being extracted. 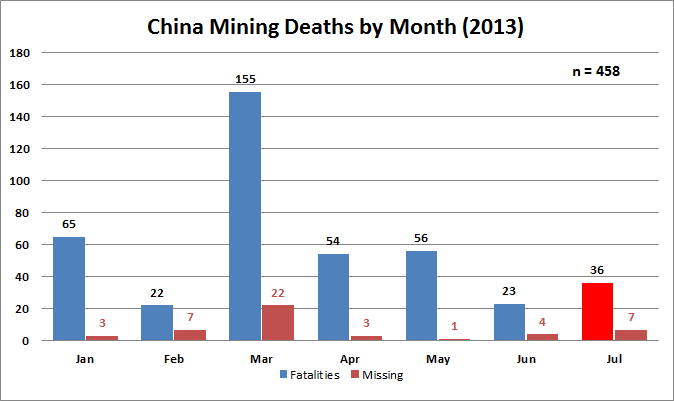 The final graph looks at reported mining deaths by month including provisional numbers for the current month. I have split the graph to show confirmed fatalities and those still missing at the time of the latest reporting. Often Chinese media do not follow-up on previous incidents. To June the incident average is 5.7 per month and the fatality average was ranged between 62.5 to 69.2 (if you include the missing). With three incidents which claimed more than 25 lives each, including the Tibetan landslide which killed 83, March was the worst month on record for 2013. This analysis can only scratch the surface of what is going on in the Chinese mining industry. A commonality of the 40 incidents reported by Xinhua was that they covered accidents which involved three or more persons. Thus, a huge amount of individual deaths and injuries that can happen on any mine in any part of the world including Australia must surely go unreported. There is also no way to validate this data against a Chinese regulator. In all fairness to the Chinese it is also difficult to get immediate injury and fatality data from Australian mining regulators and Work Cover entities. Another factor here is illegal mining. To date at least six incidents and 54-deaths occurred in illegal mines which have subsequently required a major rescue effort. How many unknown accidents and tragedies have gone unreported? While China remains the most power hungry nation on the planet one unfortunate (yet certain) point can be taken from this analysis. There will be more tragedies. Updated all infographics and some text with an additional six incidents between 6 June and 8 July 2013. Updated all infographics and some text with an additional three incidents between 9 – 24 July 2013.